Along with warmer temperatures, springtime is bringing many exciting developments to Women’s College Hospital! Read on for an announcement about a new public awareness campaign to educate Canadians about the “Health Gap,” registration for the 2016 SHOPPERS LOVE. YOU. Run for Women and valuable insights from Women’s College Hospital medical leaders, to name just a few of the great reads you’ll find in this issue of your e-news. From all of us here at WCH Foundation, thank you for being a vital member of our donor family — you’re changing and saving lives! April 11 to 16 is National Volunteer Week and we’re celebrating! 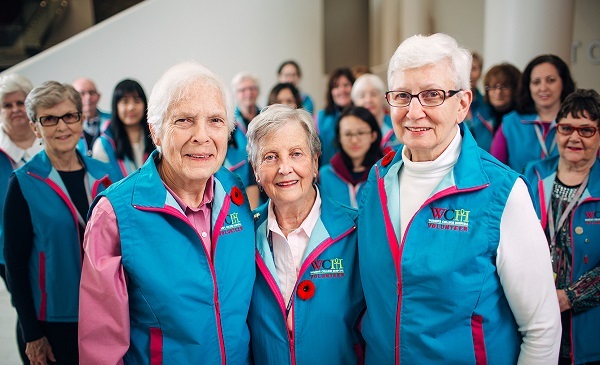 For over 100 years, volunteers have been the heart and soul of Women’s College Hospital. From rocking babies and sewing clothes for newborns to raising $1 million to help build the new home of WCH, generations of volunteers have had an enduring impact on Women’s College Hospital and its patients. Click through to read more about the incredible legacy of volunteerism at your hospital. As the only hospital in Canada devoted to revolutionizing the health of women, Women’s College Hospital is leading the way in identifying and closing crucial healthcare gaps that are putting women’s lives at risk. As a generous donor, your support makes this life-changing work possible every day. From April through June, Women’s College Hospital is bringing the public’s attention to the “Health Gap” through an awareness campaign that encourages Canadians to learn more, spread the word and donate to help close the gap. Look out for media coverage, subway posters and much more. To learn more, visit www.thehealthgap.ca or click through to read the full press release announcing the campaign. Dr. Valerie Taylor, psychiatrist-in-chief at Women’s College Hospital, recently sat down with journalist Emilie Dingfeld to talk about the different types of mental health treatments available. With approximately 50 per cent of all women facing a struggle with mental illness at some point in their lives, including 20 per cent of pregnant women, Dr. Taylor educates readers about the importance of knowing which treatment may be best for you. Register today! The 2016 SHOPPERS LOVE. YOU. Run for Women is a fun and fabulous 5K/10K walk and run event supporting WCH’s Women’s Mental Health Program. This year, the Run for Women will start and end at Women’s College Hospital in downtown Toronto! Dr. Danielle Martin, family physician and vice-president of medical affairs and health system solutions at WCH, recently wrote an article for Chatelaine magazine about turning 40. Taking a moment to reflect on the passing of time and how women experience each decade of their lives, Dr. Martin’s thoughtful essay shares insights that every woman can relate to. Click through to read the full article. What do Women’s College Hospital, shoes and Sophie Gr�goire Trudeau have in common? Zvelle, a Toronto-based luxury shoe company and new partner of WCH Foundation! During Prime Minister Justin Trudeau’s state visit to Washington, DC in March, Sophie was spotted wearing beautiful Zvelle shoes. Click here to read a Washington Post article mentioning our new partnership with this wonderful company. On March 8, WCH community members celebrated International Women’s Day by telling us how they’re helping to achieve gender parity. Their pledges were displayed in the Peter Gilgan Atrium to inspire and empower others to work toward a more equitable future for women and for everyone. We respect your privacy, . At any time you may edit your e-mail preferences by visiting Email Preferences.